Disclosure: I was sent a sample pack of snacks and drinks to facilitate my review. This post contains affiliate links. The views expressed in the post are my own. It’s a good thing that I never close the door to my basement. I leave it open and never close it. Why is that you ask? Well, right now there are 10 swim suits hanging from the door knobs. Five on each door knob of my basement door. I couldn’t close the door if I tried! All three of my kids are current or former swim team swimmers. My oldest was a summer swim team swimmer from age 8 through the end of middle school. My youngest is also a summer swim team swimmer who has tried year-round swim team. But it is my middle child who is the reason why the basement door knobs are draped with swimsuits. She swims on three swim teams. She swims for our summer swim team. During the winter she swims for her school swim team. The bulk of her swimming is done with her year-round swim team. Swimming a whopping 12-14 hours a week with her year-round swim team and a few more hours with her winter swim team means my middle child needs A LOT of swim suits. She has practice swimsuits, team swim suits, and even competition swim suits. She rarely has a day when she doesn’t swim. I received an email a few weeks ago tht had my daughter written all over it. Pomchies makes brightly colored hair accessories and other items. The twist is that all Pomchies products are made with swim suit material. 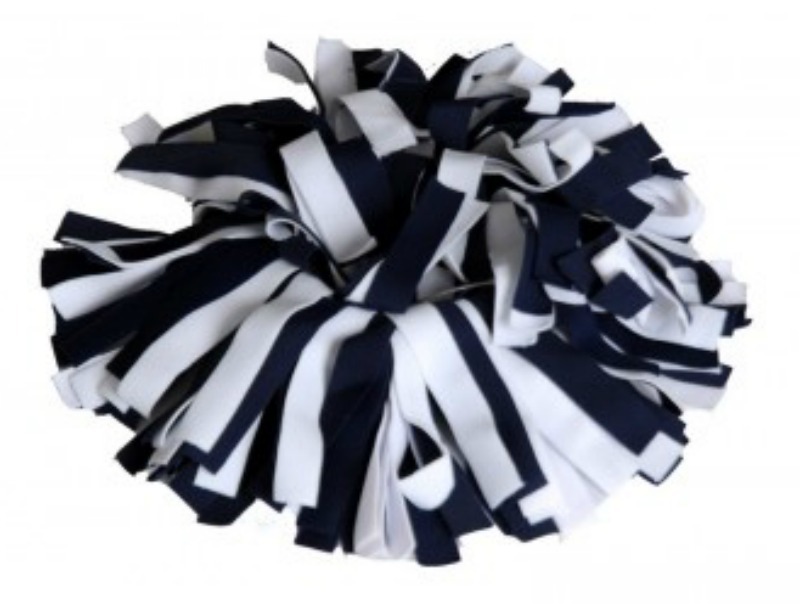 Pomchies items are fully washable and can be customized in sports teams, activity clubs, or your favorite colors. I thought my daughter would love them and I was RIGHT. She has a couple of the Pomchies Pom IDs on her swim bag. Pomchies Hair Accessories — Come in Solid Colors, Spirit Colors, and Fashion Colors. Solid Colors: White, Black, Navy, Red, Tropic Pink, Powder Pink, Old Gold, Silver, and more. Pomchies Spirit Colors shown in the photo, from right Royal/Yellow Gold/White, Cardinal Red/White, and Light Blue/Royal/White. Fashion Colors are Goldie, Pretty ‘N’ Pink, Glory Days, and more. Pom ID Tags — Pom ID Tags are the perfect accent item for a sports bag, purse, or swim bag. Colors available include the Spirit Colors and the Fashion Colors. Pom-Key Keeper — The Pom-Key Keeper is braided with a key chain ring at the end. Colors available include the Spirit Colors and the Fashion Colors. Pom-Lanyard — The Pom-Lanyard is made of swimwear fabric braided in a neat design with a key chain ring at the bottom, Like all other Pomchies products, the Pom-Lanyard is made of a washable swimwear fabric. For the complete product line, visit Pomchies.com.